This amendment is designed for a situation where the landlord and tenant wish to extend the original term of the lease, provide for additional renewal options with fair market rentals, and add additional expansion space to the premises to accommodate the tenant's growth. This satisfies the tenant, and will prevent the tenant from looking elsewhere for new space for its operations. 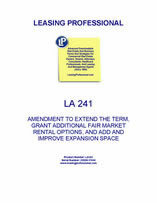 THIS LEASE AMENDMENT (the “Amendment”), is made and entered into this _____ day of ________, 200_, by and between COMMERCIAL PROPERTY LANDLORD, INC., hereinafter referred to as "Landlord," and ACCEPTABLE TENANT, INC., hereinafter referred to as "Tenant," and modifies that certain lease (the “Lease”) executed by Landlord and Tenant on _____________. A. Landlord and Tenant entered into that certain Lease Agreement dated as of the __th day of _____________ (the "Lease"), whereby Landlord leased to Tenant a certain building containing approximately ______________ square feet, known as _______________________. B. Pursuant to the Lease, Tenant leased from Landlord an additional ___________ square feet in the building located at ________________ (the "Expansion Space"). C. The Term of the Lease was to terminate _______________ and Landlord and Tenant have agreed to extend the Term as set forth herein. 1. Expansion Space. Subject to and upon the terms, provisions and conditions set forth in the Lease, Landlord does hereby lease to Tenant, and Tenant does hereby lease from Landlord, approximately _________________ additional square feet in the building located at ____________ (the "Expansion Space"), which Expansion Space shall become a part of the Premises during the term of the Lease, the Premises being stipulated for all purposes of the Lease to be as more particularly set forth on Exhibit A attached hereto and made a part hereof for all purposes. 2. Term. The term of this Amendment shall commence on ____________, (the "Extension Term Commencement Date") and will continue thereafter through ______________ (the "Lease Termination Date"), unless sooner terminated in accordance with the terms of the Lease (as amended hereby). Landlord and Tenant agree that all terms, provisions and conditions of the Lease shall remain in full force and effect up to and until the Extension Term Commencement Date. Years 1-2: ________________________ Dollars ($____________) per annum (approximately $________ per square foot) payable in twenty-four (24) equal monthly installments of ___________ Dollars ($__________ ) per month. Years 3-5: ________________________ Dollars ($____________) per annum (approximately $________ per square foot) payable in thirty-six (36) equal monthly, installments of ___________ Dollars ($_________ ) per month. Years 6-12: ________________________ Dollars ($____________) per annum (approximately $________ per square foot) payable in eighty-four (84) equal monthly installments of ____________________ Dollars ($___________) per month. Notwithstanding the foregoing provisions of this paragraph to the contrary, if Landlord has not delivered possession of the Expansion Space to Tenant on or prior to ____________, 19__, free from all parties in possession and with all personal property or other property belonging to the existing tenant or any other party removed therefrom, Tenant's obligation to pay rental with respect to the Expansion Space shall not commence until the date that Landlord so delivers possession of the Expansion Space to Tenant and the rental payable pursuant to the preceding provisions of this paragraph shall be proportionately reduced until such time as the Expansion Space have been so delivered to Tenant.